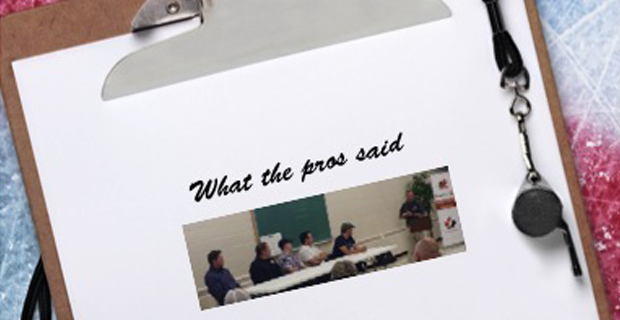 On the first night of Hockey Eastern Ontario’s High Performance 1 seminar, we invited four former pro players and one current junior A coach (who played minor pro) to a panel discussion about developing the elite player. One could argue that even recently retired pros are still at least two decades past their formative minor hockey years. Much has changed in the game and society since they were little gaffers. Can their points be relevant today? I’ve never been one to equate playing ability to coaching ability. In my experience, I’ve seen few former great players at any level who, by virtue of their playing, became terrific minor hockey coaches. The skill sets are just too different. Nevertheless, their experiences and understanding of what separates a kid who makes it from one who doesn’t are instructive and informative. They do know what it takes to climb the ladder and have seen dozens of kids they played with not make it to the first rung, let alone the top. Most are appreciative of the talent they had, though they know full well it took more than just talent to get them to pro hockey. Our panel included three fellows with a combined over 2500 NHL games played. A fourth played in the AHL and was an NHL executive while the junior coach was once a minor pro player himself. All agreed that the teaching of skills was central to the future success of elite kids. They’d be taught systems later. As one guy pointed out, by the time they hit the pros, they’ve seen every system ever devised. But their ability to think, to react, and then to have the skill to implement is another matter altogether. But what was particularly interesting was the reaction to the very first question posed: is there a difference between an elite coach and a coach of elite kids? It provoked a bit of silence. As moderator, I was asked to repeat the question. These had been, after all, elite players themselves. Did they achieve their successes regardless of their coaches? One ex-NHLer then nailed the answer. You can have an elite coach of house league kids, he said. Yet much of what he learned, he later added, came from playing on the outdoor rinks, a virtually lost activity these days. With the exception of one fellow who remembered his major junior coach’s repeated handful of drills, none of the panel members mentioned recalling particular drills or modes of training. What stood out for them was that the game was always fun. These were important messages for the audience of 50 coaches working to obtain this important level of certification. What will they have taken from such dialogues? Will they become elite coaches?